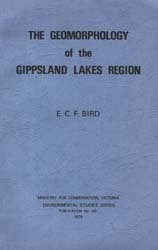 This publication is a revised and updated version of the monograph, "A Geomophological Study of the Gippsland Lakes (Australian National University Press, 1965)", which in turn derived from the thesis, "The Gippsland Lakes, Victoria: a geomorphological study (Australian National University, 1959)" by E C F Bird. The thesis was based on research carried out in 1957 – 59 in the Gippsland Lakes region, and the monograph included the results of further work in the 1963 – 64. Since 1965 I have made frequent visits to the Gippsland Lakes region, usually accompanied by student groups from the University of Melbourne, for further research, and to observe changes that have been taking place, notably during the 1967 – 68 drought period and the 1971 floods. The aim, was to provide an account of the geomorphological evolution of the Gippsland Lakes, together with their adjacent terrain, and to describe and analyse the changes in progress around their shores. The Gippsland Lakes are now well known as an example of a natural system that has been substantially modified as the results of man’s activities, in particular the cutting of an artificial entrance from the seas. The problem that now faces the Environmental Study is the assessment of changes, both natural and man-induced, as a basis for future management of the Gippsland Lakes and their hinterland. A geomorphological account provides the background for such an assessment.